We are looking forward to this time of fellowship and worship. The gathering of communities is how we all grow stronger together. 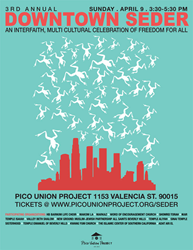 The Pico Union Project will host the Third Annual Downtown Seder on April 9th in their historic multi faith space. A diverse group of faith communities including synagogues, churches and mosques will come together to celebrate the Passover values of freedom, diversity and acceptance. Now in its 3rd year the Downtown Seder has become a highlight of the Pico Union Project calendar. "Passover is one of my favorite holidays and the opportunity to celebrate its universal message of freedom has never been more relevant," said Craig Taubman, founder of the burgeoning downtown non-profit. Although billed as a "Passover Seder" the afternoon will follow a rather non-traditional journey, including introspective songs and stories from each of the participating faith groups. "We are looking forward to this time of fellowship and worship. The gathering of communities is how we all grow stronger together," said Rev. Najuma Pollard, spiritual leader of Word of Encouragement Church. The afternoon will celebrate shared spring rituals from Muslim, Jewish and Christian faith leaders as well as songs by Danny Maseng and Hillel Tigay, stories by Jason Chu and Naomi Ackerman, and interactive art with acclaimed painter Sharon Kagan.